You can schedule blog posts to automatically publish themselves at any time in the future. 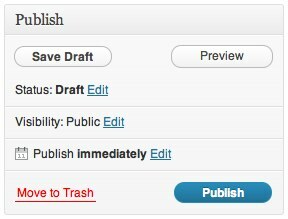 If you want to remove an already published post and automatically republish it at a specific time/date in the future, the directions are the same: In the Publish metabox to the right of the post editor, click the blue Edit link next to Publish immediately. Set the future date/time when you want the post to publish itself and click OK. To schedule a post in the PM, you will need to use the 24-hour clock. 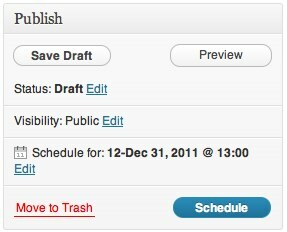 For example, 1:00 PM would read as 13:00 in the Schedule a Post module. The time will be based on your location settings in your Settings -> General page. 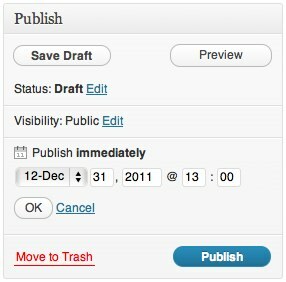 Instead of Publish immediately, it will now say Schedule for: followed by the date and time you specified, and the button has changed from Publish to Schedule. Click Schedule. Scheduled posts will be triggered by the first visit to your blog on or after the exact date/time you set. If you see that the scheduled time has come and gone and your post has not published, simply log out of WordPress and view your blog’s front page. Your visit should cause the post to appear. If you’ve scheduled a post to be published in the future, but changed your mind and want to publish it immediately, head back to the Edit Post page for your scheduled post. In the Publish module, click on the “Edit” link next to the date for which you’ve scheduled your post: Then, enter today’s date and time as your scheduled post time and click on “Ok.” When finished, click Publish and your post will be published immediately. Watch the “Publishing your post at a later date” video from WordPress.tv.